I have found myself increasingly unimpressed with the power metal scene as of late. While there are a few bands out there that really pique my interest in this genre today, there seems to be a flood of bands that all sound alike. Well, leave it to a band with the most cliché word in metal (Dragon) as part of their name to get me excited again. Dragonforce returns with their sophomore album, vastly improved over their admirable debut, Valley of the Damned. Dragonforce are still playing their brand of melodic speed / power metal, but the music on Sonic Firestorm comes together much better than it did on the debut. Upon hearing the first track, My Spirit Will Go On (which you can sample at the band's website), I can tell that two of my chief complaints about the debut have been improved. The production and mixing this time around is much better. The sound is much more clear and crisp, with the vocals not buried in the mix. As for the vocals themselves: 500% better!! ZP Theart's voice sounds more full bodied and rich and he stays away from the ultra high notes that he struggled with at times on the debut. The bottom line is that ZP is using his voice much more effectively on this album, which in turn adds more character and emotion to the songs themselves. In addition, his voice sounds even more melodic when he stays away from those painfully high notes. What can I say about the guitar work? Amazing. There is no shortage of stunning solos and shredding throughout the album as Herman Li and am Totman really deliver the goods on guitars. The dual rhythm guitar work is executed precisely and the riffing is of course fast and very forceful. The rhythm section should not be overlooked, especially new drummer, David Macintosh. Macintosh joins Dragonforce after participating in three full-length albums with Bal-Sagoth. As some folks complained that the drum work was too aggressive on the debut, I think that Macintosh's style will sit very well with these people when they hear Sonic Firestorm. Don't worry, the speed metal delivery is still dominating the album, however Macintosh's style is a little more interesting and there are times when he can bring it down a notch when appropriate. This new element to the band is perhaps why Dragonforce were able to branch out little bit with their songwriting this time around. Most of the songs fall in the 6-7 minute range, yet the songs never becoming boring or repetitive. There are a few moments when the band throws a mid-tempo breather into the song (check out the almost prog sounding break in Prepare For War), something that I think keeps the sound fresh, while not abandoning their "hypersonic speed metal" sound. Of course, what would a Dragonforce release be without lots of excellent melodies? As expected, the guys deliver on this count also. To my ears, Sonic Firestorm is just about the best marriage of speed and melody that you can have. Each song is packed with uplifting, yet not too "sweet" or cheesy melodies. As a result, there simply isn't a sleeper track on this album. You'll leave this album after the first listen easily able to identify each and every killer track that makes up Sonic Firestorm. 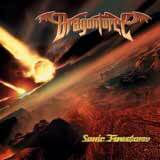 Simply put, I couldn't have asked for a better album from Dragonforce. They are becoming the masters of melting ferocious speed, instantly recognizable melodies, and technical prowess into on helluva listening experience. If you liked Valley of the Damned, you're gonna love Sonic Firestorm. For me, this album will be tough to beat for power / speed metal album of 2004. One logistical item I'd like to mention: Cry of the Brave is killer track is every sense, but it appears on the Japanese release only. If you decide to shell out extra for the Japanese copy, rest assured that you are not getting some second rate "b-side" quality track. Spinefarm Records recently reissued Valley Of The Damned and Sonic Firestorm — the first two full-lengths from Dragonforce (in the spring of 2010). Sonic Firestorm gave the band the chance to hone their skills and push their fast-lane tales of fantasy to a whole new level. They were happy with the record and remain so to this day, which is why the mixing and the mastering remain untouched. Instead, Sonic Firestorm reissues comes with upgraded packaging, an extra track added (Cry Of The Brave, a song the band wasn't initially comfortable with when it was first written) and a bonus DVD featuring more live footage from Japan, video commentaries, interviews and more.